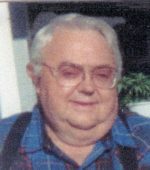 John E. Babcock of Plainwell passed away Tuesday, April 4, 2017 in Kalamazoo. John was born January 8, 1932 in Hope Township, Michigan, the son of Kenneth and Ora (Hine) Babcock. After graduating from Middleville High School he enlisted in the U.S. Army, attaining the rank of Corporal while serving his country. He was retired from James River Paper Company in Kalamazoo. On August 30, 1952 he married Ollie “May” Martin, she preceded him in death on February 15, 2014. May and John loved children and were foster parents to over 100 children over the years. He enjoyed traveling and camping, which often involved his other interest which was cross country motorcycle racing. John was a member of the Ring City Road Runners of Hastings and spent as much time as he could spare riding his Harley. Survivors include his children, Dan Julien of Kalamazoo, Danny Babcock of Plainwell, Cindy Liska of Portage, Deb Babcock of Pontiac and Tim Babcock of Plainwell; 14 grandchildren, great grandchildren, his sister Jane (Bob) Groscost, sister in law Lora Babcock, many nieces and nephews, and his special friend and caregiver, Orin Armintrout. In addition to his wife, he was preceded in death by his brother Dean. Friends may visit with his family 5:00 – 7:00 pm Friday, April 7, 2017 at the Winkel Funeral Home. Funeral Services will be held at 11:00 am on Saturday at the Winkel Funeral Home. Private interment will take place at Union Cemetery, Lacy, Michigan. Memorial Donations may be made to the Development Office, 1608 Lake Street, Kalamazoo, MI 49001 to assist children in the Foster Care System. Messages of condolence may be posted at www.WinkelFuneralHome.com.